detail from the cover of the Australian Video Festival, 1987. The Tetra Vision Synth (TVS) or Tetrasynth is an analogue modular video synthesiser made in the shape of a tetrahedron. The electronics have been built using original schematics designed by Stephen Jones in 1996. The synthesiser is composed of a total of 12 modules made up of three distinct designs: the VCO module or video oscillator, the effects module, and a patching and viewing module. Each of the identical three faces of the TVS contribute to the red green and blue analogue outputs which appear on the final display. Unlike the traditional rectangular modular synthesis designs, the three faces of the TVS stand at an axis, inviting participants to engage in synthesis in a collaborative and relational manner. 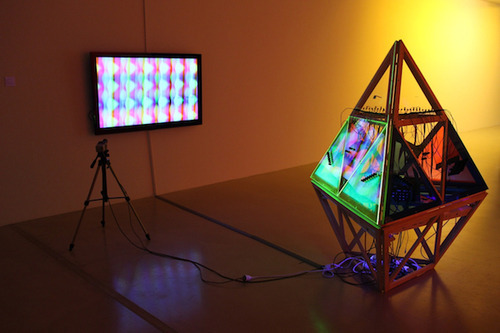 The TVS was built in a collaborative mentorship between electronic video artist, engineer and historian Stephen Jones and Pia Van Gelder. The project was presented as a part of the ISEA2013 program.